Silverton’s Le Pooch Dog Grooming has moved down the way and has a new owner. Effective April 2 the new location at 106 N. First St. (formerly “Body Theory”) will be open for business. 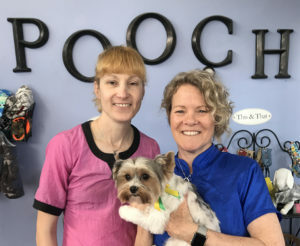 Jodie DeSantis, who has owned Le Pooch for five years, has decided to pursue a new career path. She and her husband, Ken, live in Silverton with their rambunctious 10-year-old Welsh Corgi, Ruby. She is happy to hand the leash over to new owner, Joan Fusek, who presently lives in Corvallis – but eventually plans to move closer. Fusek has 16 years of dog-grooming experience – including having had the opportunity of being trained by a show groomer. Born and raised in Chicago, Illinois, she left home at 18 to attend college in St. Paul, Minnesota. Wanting to move further south, she and her older sister then relocated to Austin, Texas, and stayed for five years. “In 2002, my older sister and her young son ended up moving to Oregon. We were ready for a change. When we first got here, I moved to Junction City. After a couple years, I moved to Harrisburg and then to Corvallis in 2016,” she said. In addition to grooming, Fusek plans making her business a canine’s one-stop shop. “We’re hoping by the Fall to start selling some really good dog food and toys – items not made in China or other outside countries. I want to get a lot of American-made products come into the business. We’ve all heard that there are a lot of poisons that get into some food and toys. We really want to focus on natural health and wellness for pets,” she explained. “Owning Le Pooch has been a blessing in my life,” DeSantis said. “I’m excited and ready to reevaluate my career and start my next chapter.” Her advice for Fusek is simple. “When the fur is flying and the dogs are barking, just remember you have the best job ever. Truly, it is a joy getting to visit with the nicest dogs in this town,” she said. Sammy Whitney, the current officer manager and bather, will continue in her roles at the new location. Le Pooch’s phone will remain the same, 503-873-7750. Open Tuesday – Saturday, 8 a.m. – 5 p.m.